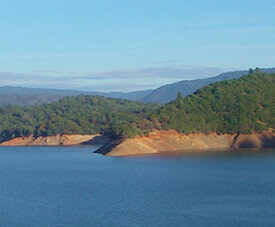 Lake Oroville is a little more than an hour north of Sacramento and is the second largest man-made lake in California. Lake Oroville is the product of Oroville Dam on the Feather River approximately 75 miles north of Sacramento. The reservoir has 167 miles of shoreline and covers nearly 16,000 acres of surface area. 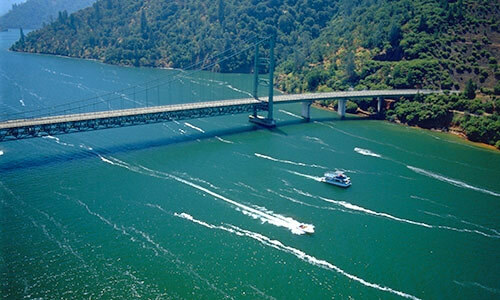 All four seasons take place in this area, and lake temperatures range from 46 degrees to 78 degrees F.
Lake Oroville provides an unbeatable opportunity for water sports and recreation, with over 25 sq miles of beautiful lake surface to play on, and some of the finest fishing opportunities in the western United States. Lake Oroville boasts the best bass fishing in California. Largemouth, Smallmouth, Spotted, & Redeye Bass, Black & White Crappie, Sturgeon, Catfish, Rainbow, Brown, & Lake Trout, and Coho Salmon are open season all year long! The placid waters of Lake Oroville are cool and inviting. 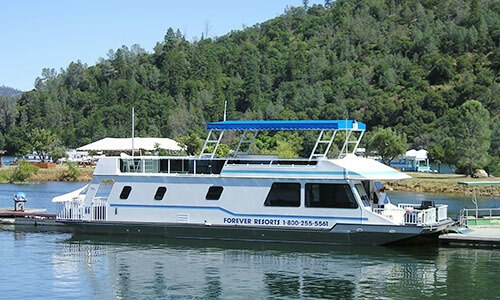 Cruise the lake in your houseboat, fish for spotted bass, Chinook salmon, catfish and rainbow trout, play on your personal jet-ski or watercraft. The lake is located on the Feather River at the foothills of the Sierra Nevada mountain range. In the spring, boaters can travel up the middle fork of the river and see Feather Falls – an astonishing 640 feet high waterfall! The lake's forested coastline provides a quiet escape where visitors can enjoy beautiful mountain views and limitless nature recreation. Hikers can climb up to see panoramic views of the Sierra Nevada and the Sutter Buttes Mountains. Many biking, hiking, and equestrian trails weave throughout the Lake Oroville State Recreation Center. Sailing, snorkeling, and windsurfing are popular sports here once the lake becomes seasonably warm. Lakeside and floating campsites are located throughout the region. The Lake Oroville Visitor Center has a museum and exhibits for guest entertainment. A few other historic museums can be found in the town of Oroville.